Group centered around the personality of Petra Polak, a teacher with musical ambitions. 51,2 sec. - 101 Kb. 52,1 sec. - 102 Kb. Petra was born with three sisters, all of whom sing on occasions. After Pitti Polak scored some hits with her group, they performed together under the name "the Polak Sisters". 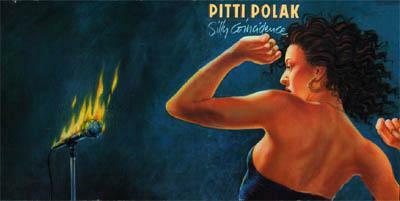 The debut album of Pitti Polak (preceded by the singles "Happy doing nothing", "Poor, stupid and ugly" (three things she's definitely not) and "Silly Coincidence" was a big hit. The album was produced by Jo Bogaert, the man behind Technotronic, and Werner Pensaert, the man who worked with the Scabs all his career. The cd-cover was done by cartoonist Jan Bosschaert (Humo, Sam ...). A few years later, the group released the album "Spirit" which didn't gain much attention. Petra announced she would quit singing, a decision which she later revoked (She got a first kids, and Pitti Polak still stands in front of the classroom), as she told Jet-Magazine : "Paul Mertens, my husband and bassplayer/composer, wanted to get going again for some time, but I didn't care much for that idea yet. A lot of people insisted and the record firm phoned regularly to find out if Paul had some new songs. That's good for the ego, of course. But the main factor in the decision to return were the empty summers. Getting rid of the weeds in the garden all summer long isn't exactly my idea of a good time. I'd rather do gigs then". In 1998, Pitti Polak got her second baby "Melanie" and her third CD "Pictures Lie" at almost the same time (she promoted it only a few weeks before giving birth). The CD was produced by Mike Butcher (best known in Belgium for his work with Arno) and Marty Townsend (who has worked with Blue Blot before). The only song that "did something" on the radio was the single "A little mistake", the rest of the CD suffered a bit from a lack of live-promotion for the album.